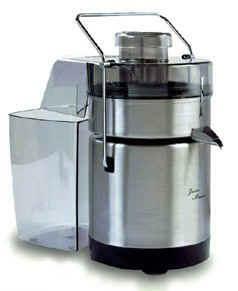 The Pro Stainless Steel Juicer - The ultimate "Health machine." When you own Juice Master 2000 you enjoy all these advantages: Simple to use, easy to clean. Highly reliable powerful 6000 RPM air cooled motor with patented speed control and turbo boost. Automatic pulp ejection, advanced design & superior quality. • You'll lose and control weight naturally! Superior Nutrition - No store bought processed juice can match the pure nutritional power and taste of freshly made Juice Master juice.